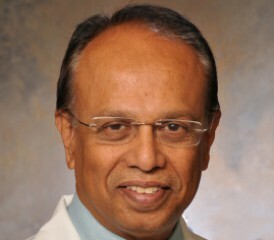 Renowned thoracic surgeon Dr. Wickii Vigneswaran in Chicago believes far too many patients with pleural mesothelioma are being denied aggressive surgeries that could improve their quality of life. He wants to fix that dilemma. Vigneswaran, a mesothelioma specialist at the Loyola University Medical Center, authored a recent study debunking the long-standing belief that major surgery is too taxing for all but the healthiest patients. Less than 30 percent of mesothelioma patients actually undergo aggressive surgery with a pleurectomy/decortication (P/D) or an extrapleural pneumonectomy (EPP). Vigneswaran believes that rate should be at least double. Quality of life almost always improves after surgery, regardless of the starting point, Vigneswaran said. The American Society of Clinical Oncology presented the study’s findings earlier this month at its annual meeting in Chicago. Mesothelioma is a rare and aggressive cancer with no definitive cure. It is primarily caused by long-term exposure to asbestos. Pleural mesothelioma, the most common form, starts in the thin membrane surrounding the lungs and spreads throughout the thoracic cavity. As the disease progresses, patients often experience symptoms such as breathing difficulty, chest pain, cough, fatigue and weight loss. The P/D surgery, designed to alleviate the symptoms, leaves the lungs mostly intact but removes the lining around them, parts of the diaphragm and all visible cancer throughout the chest. EPP is a more aggressive surgery that removes the entire lung affected by the cancer. In addition, surgeons remove part of the lining around the lung and heart, nearby lymph nodes and other structures in the chest. We can help you or a loved one find a mesothelioma doctor who can recommend the right surgery for you. For the study, Vigneswaran and fellow researchers surveyed 114 mesothelioma patients about their quality of life after P/D surgery. The patient group underwent the procedure from 2010 to 2015. Researchers evaluated each patient’s performance status, a measure of how the cancer affects their general well-being and ability to perform daily activities, with a numbered scale from zero to 5. Their performance statuses ranged from zero (limited symptoms, epithelioid histology and lower tumor volume) to 2 (capable of walking but unable to work, higher tumor volume and non-epithelioid histology). In addition, the survey measured overall functioning (emotional, physical and cognitive), general symptoms and overall health at various times. Patients took the survey before surgery, a month after surgery, and again at 4-5 months, 7-8 months and 10-11 months. Surgery did not adversely affect quality of life at any time for patients with a performance status of 1 or 2. In most cases, quality of life improved. The quality of life measurements dropped only in the first month for those with a performance status of zero (the healthier patients at the start), but returned to the baseline measurements by the second survey period and improved thereafter. Emotional functioning improved in all cases after surgery. The overall length of survival was significantly better among those with a zero performance status and epithelioid histology. While surgery may not significantly increase survival time for those with a higher performance status, Vigneswaran believes it will improve their quality of life considerably. He said surgery combined with the latest immunotherapy drugs will allow more patients to live considerably longer and with a higher quality of life than before. Vigneswaran also said he would like to see more mesothelioma patients offered the surgical option, but only at a handful of specialty centers most equipped to handle a complex operation and follow-up care.